Chinese New Year (Spring Festival) is a major holidays in not just China but also other countries in Asia. Here are 10 interesting facts about this important and popular holiday. The date for Chinese New Year changes each year. It always falls between January 21 and February 20, determined by the Chinese lunar calendar. 2. The holiday is oddly called “Spring Festival”. Though in winter, Chinese call their New Year holidays ‘Spring Festival’ (春节 chūnjié /chwnn-jyeah/), because ‘Start of Spring’ (4–18 February) is the first of the terms in the traditional solar calendar. While wintry weather prevails, ‘Start of Spring’ marks the end of the coldest part of winter, when the Chinese traditionally could look forward to the beginning of spring. 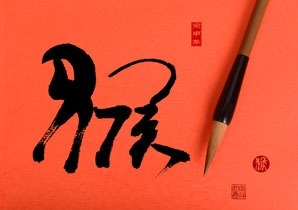 Chinese zodiac years: A very old custom is to name the years by one of 12 animals in their zodiac cycle. For example, 2016 is a year of the Monkey. 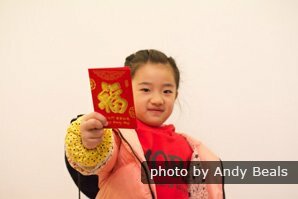 Many Chinese still believe in astrology and other New Year superstitions. 4. It is a festival for 1/5 of the world’s population. It’s China’s winter vacation week, like between Christmas and New Year’s Day other countries.Schools in China get about a month off, and universities even more. China, Hong Kong and Macau, and nine other Asian countries have public holidays. 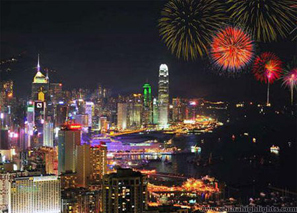 Hong Kong blazes with fireworks and lights dance on the buildings. China: 1.3 billion in China get three days of public holiday. Indonesia: 250 million people in Indonesia get one day of public holiday. Philippines: 100 million get one day of public holiday. Vietnam: 90 million people get at least three days of public holidays, but the holidays sometimes extends for an entire week by taking away weekends, as in China. South Korea: 50 million people get three days of public holiday. Malaysia: 30 million people get one day of public holiday. North Korea: 24 million people get three days of public holiday. Taiwan: 24 million people get four days of public holiday generally. Brunei: One day of public holiday. Singapore: Two days of public holiday. Hong Kong: Three days of public holidays, extending to four days if the holidays fall on a Sunday. Macau: Three days of public holiday, extending to four days if the holidays fall on a Sunday. 6. It’s big in London and HK. 500 thousand people converged for Chinese New Year in London’s Chinatown, Trafalgar Square, and central London streets in 2013. In Hong Kong, a big holiday custom is horse racing: The most popular races of all in the city happens on the third day of the Spring Festival holidays when 100,000 excited fans crowd into Sha Tin Racecourse. The spectators watch a grand opening show, a featured lion dance, and a variety of cultural performances and entertainment. 7. 4% of the world’s population are on the move. 200 million Mainland Chinese travel long distances for these holidays, and it is estimated that there are 3.5 billion journeys in China. For comparison, less than 100 million people travel more than 50 miles during the Christmas holidays in the US according to the American Automobile Association. Tens of millions of people travel in other countries too. In Korea, 30 million people visited their hometowns in 2013. 8. There is the world’s biggest annual fireworks usage. No single hour in any other country sees as many tons of fireworks lighted as in China around the midnight beginning Chinese New Year. China produces about 90% of the world’s fireworks! 9. The Lantern Festival once ended 16 days of festivities. 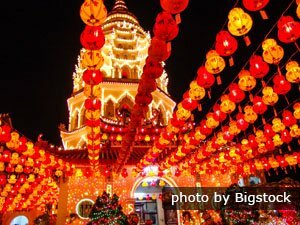 The Lantern Festival: In the evening of 15th day of the first lunar month, on the night of the full moon, families gather for dinner and go out and see fireworks and light lanterns. Lanterns are put up for decoration, let loose to fly, and floated in rivers. Ice lanterns shine in Harbin: High-tech giant ones glow with beautiful colors. Thousands of traditional smaller ones are lit also. 10. “Xinnian Kuaile” means “Happy New Year”. Xīnnián kuàilè! (新年快乐). That’s pronounced “sshin-nyen kwhy-luh”, by the way. 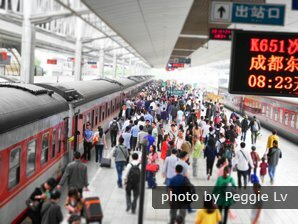 High season: It is by far the busiest travel period in China. The heaviest travel periods are a few days before Chinese New Year and around 8 days after. Get your tickets as early as possible before the holidays. Check Chinese New Year dates. Beijing Tours: Beijing has great architecture, long history, and grand celebrations. Tell our tour experts what you want to do during your tour. Tour Hong Kong during Chinese New Year: You can enjoy Hong Kong’s world class events, shop, and enjoy the warmer weather. Or we could help you create your own Chinese New Year tour. Experience Chinese New Year with Local Family: To give a more authentic experience to customers, we would like to invite people who travel to Guilin during the Spring Festival (February 7–22, 2016) to visit a local family. There you can discover Chinese traditions in the special days. Please feel free to ask your travel advisor to arrange a family visit.